Five- A Great Age To Be- Sir John Patrick “Jack”! Love to you on your birthday Jack. You make a great knight! 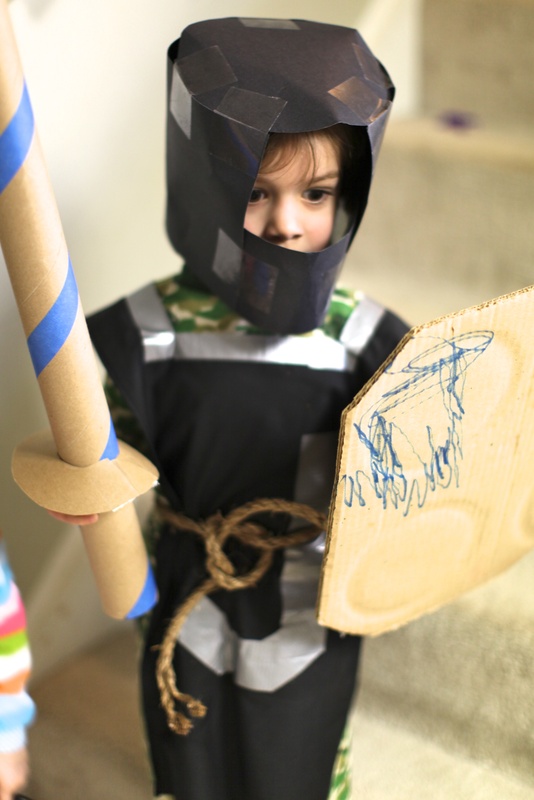 A mom made these knight tunics, helmets and lance and shields for her son's birthday party guests. WOW. Awesome costume and photo! He makes a cute little knight. Thanks for stopping by and writing a nice comment today. He had a happy birthday with his family on vacation but saw the blogpost on their phone. I can just imagine seeing Jack and his fellow knights, seated ’round the table, eating their cake and ice cream. What fun for them and what a sight for the parents! Wish I were there to photograph that round table! Happy 5th Birthday Day Jack. Thanks for sharing his special day. Thanks for the good wishes Francine. Glad you are enjoying blogging. And I hope he stays as cute as he is for a long long time! Happy birthday Jack! Happy Birthday to our sweet little grandson. We are so blessed Ruthie. What a gorgeous looking lad! And how about a well done to mum for those cozzies? A lot of hard work there to turn out Knights of the Realm. These are wonderful times in a child’s life. I have simply 100’s and 100’s of pix of my three sons when they were little, and we can remember almost every occasion, with them dressed in their little Batman, Spiderman or whatever cozzies. Now I am trying to enjoy the same time with my grandchildren, but it’s not the same. Happy birthday young Jack I pray life will bring you everything you wish for yourself……NO not sweeties and toys Jack!…..Bigger things, later on. Thanks so much for sharing your memories Mark. Goes fast doesn’t it? I will add you to my blogroll as well, Cheers to you. Sorry Ruth, I meant to mention that I have added you to my Blogroll so that others can share in your most interesting stuff! Thanks for sharing about your little knight, Frizz. I think Jack needs a horse, too. Happy Birthday Little Knight. Fun video. Thanks for looking at the blog today and leaving a nice comment, too. I enjoy your photographs on your blog! What a terrific super hero, knight, and happy five year old boy!!!! Five is a great age! One of our grandsons will be five in April! Fun times!!! Lucky is right!!!! Yes, it is a good strong name. Thanks for your positive and encouraging words today. I am enjoying following your blog, too.